A Beauty so Rare Scavenger Hunt! The questions are posted below and the giveaway runs through Sunday night, April 27. The answers to the questions can be found on Tamera’s Pinterest page. Not on Pinterest? Doesn’t matter. You can still participate and find the answers by using this link. 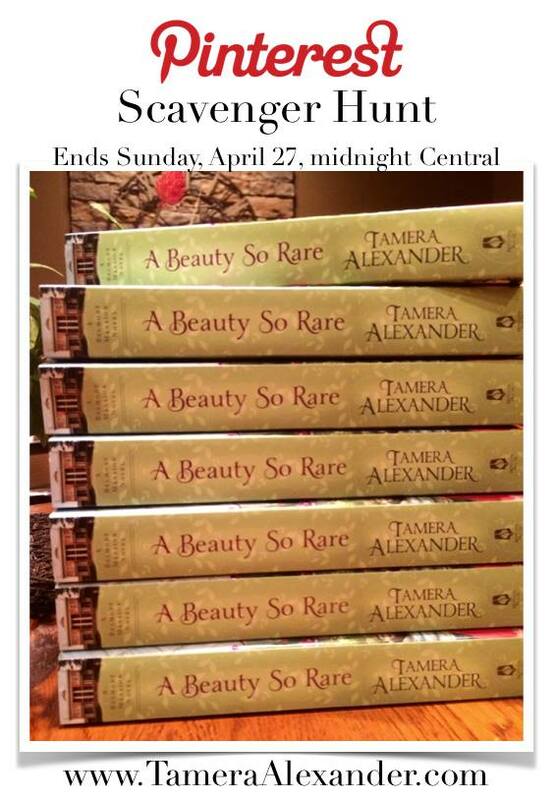 Your answers must be submitted to TameraAlexander@ymail.com (numbered 1 – 6) by Sunday, April 27, midnight Central to be entered into a drawing to win one of seven copies of A Beauty So Rare, the second standalone novel in the Belmont Mansion series. 4. On the Recipes from my novels board, what’s the recipe from A Beauty So Rare that’s posted about most often on that board (doesn’t necessarily have the most re-pins)? It’s also a favorite of Eleanor’s. 7. BONUS: LIKE Tamera’s Facebook Page for an extra chance to win.